When looking for tab for Steve McQueen by Sheryl Crow to play with my band I found three or four different tabs, but none of them agreed and none covered all the guitar parts of the song. I continued searching and happened across a digital download and print version on Music Notes. 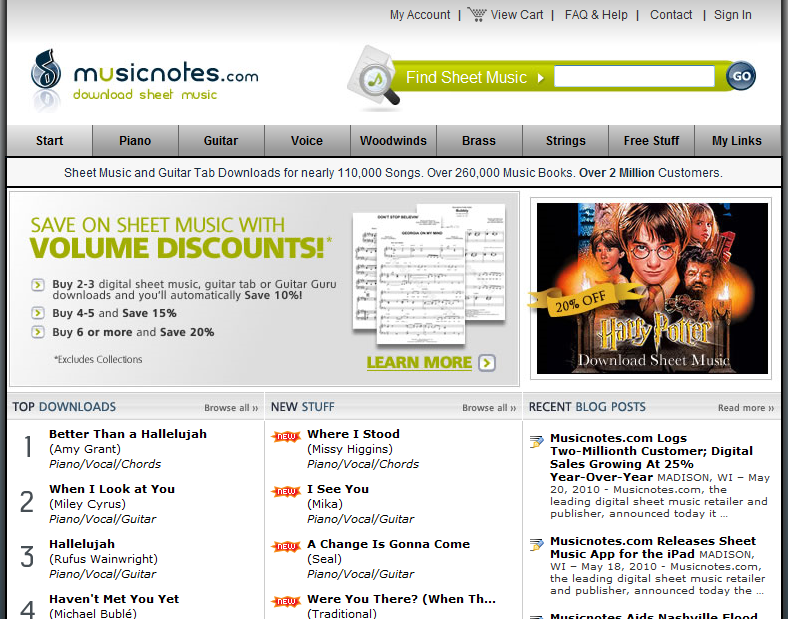 Music Notes is a web site that offers sheet music for over 100,000 titles to download and print. They also propose a large number of titles for their free Guitar Guru software that allows you to learn and play the music on an animated fretboard shown on your computer screen. The site interface is clear and easy to use with a good search feature that makes it easy to find songs. One nice feature is that you get to see the first page of scores so you can see if the arrangement is suited to what you're after (easy chords, detailed tab, standard notation...). To preview and print music you need plug-in software for your web browser. Music Notes site detected automatically the right software for my computer and browser. I downloaded the full Music Notes Suite and the install was quick and trouble free. The suite includes the Guitar Guru software. Purchasing music is easy with the familiar shopping cart style and payment via Paypal was smooth, credit cards are also supported. The purchased music is displayed for printing immediately, or if you wish you can print it later thanks to the download link displayed in the confirmation email. Music Notes allows you several goes to download and print the music, some sites I looked at offer only one chance to download and print your music. I used a PDF printer driver installed on my PC to print to a PDF file instead of paper. This lets you view the music on-screen without printing if you wish, or you can easily reprint a copy if the original gets worn or lost. All titles on Music Notes site seem to be priced at $5.25, with Guitar Guru versions at $2 more (on special offer at $1 more when I made my purchase). You can get volume discounts up to 20% if you buy 6 or more scores at once. I found other sites - sheetmusicdirect.com and sheetmusicscore.com - offering similar sheet music for between $0.99 and $3.95 depending on the arrangement. But neither of these sites have as large an offer as Music Notes and I didn't find title I was after. For example, Sheet Music Direct has only ten Sheryl Crow titles for download. I found the Guitar Guru version to be excellent value. It includes more than the printed transcription with parts for all three guitars in detail (the printed sheet music has only two guitar parts). The animated fretboard and tempo control made it easy to learn and perfect any of the parts, and I found it much faster than working with the tab. Overall my experience with Music Notes was a good one. The site was easy to use and the purchase, download and printing all went smoothly. I was happy to purchase an official, legal version of the song and I'm sure I'll repeat the experience again for other songs. I'll probably shop around to compare prices when titles are available elsewhere, popular titles can be found for up to five times less on other sites. But the wide choice and Guitar Guru will ensure that I'll happily return to Music Notes again. good review. think they've priced it a bit high though. Hi Padraig, Thanks for joining in. Agree with you on the price, I think it's going to discourage a lot of buyers, especially when other sites are much cheaper. For Guitar Guru songs though I think it's almost worth it.